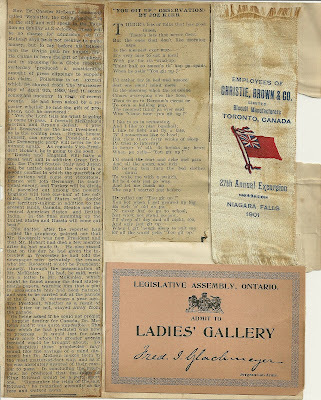 This appears to be the scrapbook page of someone from the Toronto area. 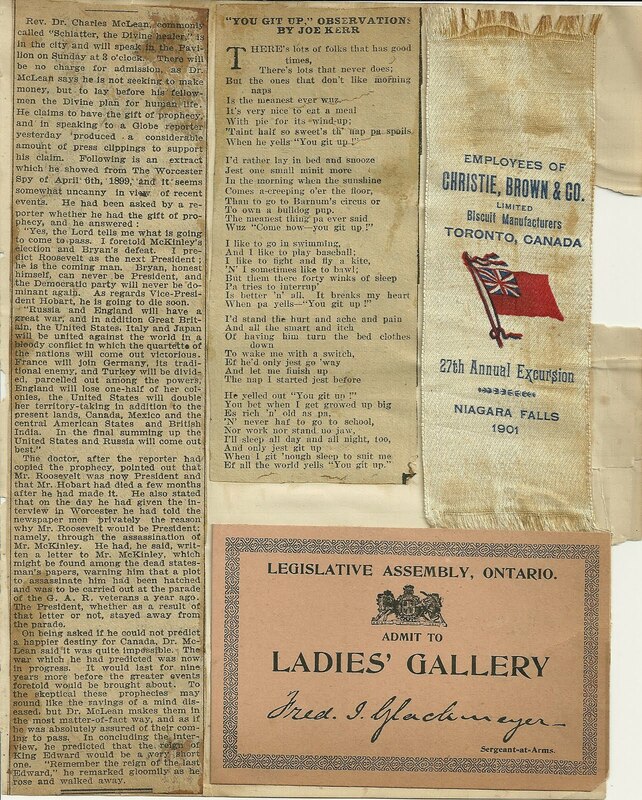 It contains two newspaper clippings, a ribbon and a pass to the Ladies' Gallery at the Legislative Assembly of Ontario. One newspaper clipping describes a reporter's interview with "Rev. Dr. Charles McLean, commonly called Schlatter, the Divine healer" - though he was not Francis Schlatter himself. The other is a poem by Joe Kerr, who loved to sleep in in the morning, though pa never let him. The ribbon was given to employees of Christie, Brown & Co., Ltd, Biscuit Manufacturers, Toronto, Canada, on the occasion of their 27th Annual Excursion to Niagara Falls in 1901. The pass to the Ladies' Gallery has the printed signature of Fred I. Glackmeyer. Finding more information about Rev. Dr. Charles McLean has been difficult. There are many newspaper accounts of him online, ranging from fawning to suspicious to downright condemnatory. Some include his violent reactions to being called out for his ruses. The original Schlatter, Francis Schlatter, was an Alsatian who came to the United States, walked thousands of miles around the West performing healings and disappeared from Colorado in late 1895. The concensus seems to be that he died in a Mexican desert in 1896 of starvation. From what I've read online, Rev. Dr. McLean apparently thought he could assume Schlatter's mantle and make a good living for himself. According to one account, he claimed that the bones found in Mexico and assumed to be those of Schlatter were actually those of his horse. And that, here I am, ready to heal again! However, apparently someone recognized him and, with further checking, he was found to be in a photograph album from the Boston area and identified in it as Charles McLean. At one point, I believe he served as a Presbyterian minister. He apparently adapted to being found out as Charles McLean, as many newspaper articles, including this one, referred to him that way. Perhaps in the beginning he went by the Schlatter name only. Another news account describes how he healed a woman of means to her satisfaction and then told everyone that they were to be married, to her apparent surprise. I don't know if the marriage went through, but several articles implied that he had the sympathy of many ladies, who hounded his frequent jailers. His career as a faith healer apparently wound down rather badly, as he was discovered to be the hermit who had died at Hastings, Nebraska in October of 1909. A note designating David McNaughton of Chicago as custodian of his effects was found with him. If you have any information on the birth or family of Rev. Dr. Charles McLean, please leave a comment or contact me directly. Someone (not me) needs to write a book about this fellow!